My Cozy Corner: Tablescape # 51 ~Button~Button~Who's Got the Button? Tablescape # 51 ~Button~Button~Who's Got the Button? I'm always amazed when I have an inspiration about a new a tablescape. I found the most darling button napkin rings at Yes! Tuesday Morning. 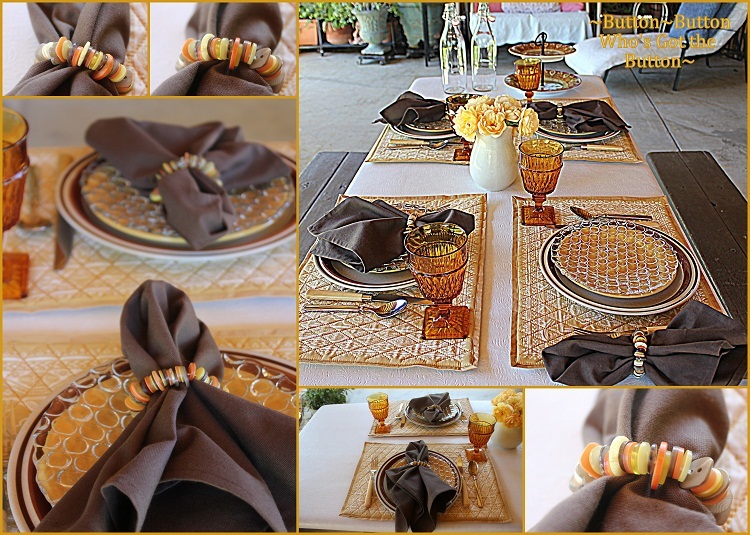 And, this tablescape is a result of 4 little button napkin rings. The hunt was on! Being a thrifty person . This tablescape was so much fun to envision . Looking at the colors of this tablescape today delight me. The golden tones remind me of a Tuscan countryside. My son took this photo of the Tuscan villa where he stayed enjoying the Italian countryside for a few days. Before going onto Rome for the rest of his vacation. The moment I saw the Italian bottles at Tuesday Morning the theme for my table was becoming clear. I will be using these wonderful bottles in other posts, so you will know the history of my Italian bottles. The centerpiece is a reflection of my love for 'Graham Thomas' the golden yellow color. The amber goblets are a GW find. They were .99cents each. The adorable button napkin rings are placed on a clear button salad plate purchased at TM. I bought 6 button plates for some extras when my family comes to dinner. The dinner plate is called 'Contemporary Chateau' Hand painted Stoneware made in Japan. The flatware is another GW purchase. I found only forks and knives, so I added my best everyday spoons to the table setting. The cutest button napkin rings. I see a DIY in the future. The table top arrangement centerpiece and the accessories remind of fall. It will be here soon. A few more outdoor tablescapes and tea party in the garden are the plans for the month of September. Well, we found out Who's Got the Button. A friend of mine gave me this delightful serving dish. I can imagine some wonderful chocolate desserts being served. Outdoors is a great place to entertain. Thanks so much for visiting My Cozy Corner. I've had a great time playing with my dishes and creating a fun tablescape. I will be joining some wonderful parties. Please visit them with me. Cedar Hill Ranch for Cowgirl Up! A special Thank You to my new followers and the fabulous comments. Love your tablescape theme and the colors! The stemware is just gorgeous and for .99?? wow, what a deal! Thanks so much for sharing and have a great night! Beautiful tablescape, the colors are so perfect for a Tuscan table. Great pictures. Cute napkin rings. I like using buttons for other things. This is a good idea. Your Tuscan inspired table is full of rich earthy colors. Very nice! What a fun tablescape! I love it..button button who's got the button! Those are the cutest napkin rings! Those clear plates are really unique too! Love the colors in this table! Love your house too! Such cute napkin rings. Love the color in this tablescape. It is perfect for late summer, waiting for fall. This is really a delightful and very different tablescape. Very clever! The napkin rings are such lovely colors and could be used with other different hues. I love your glass button plates and how you layered them. This does remind me of a Tuscan table. The place your son stayed is so beautiful. Hi Betty, so nice to meet you. I gather you live in northern California. Your button tablescape is adorable. Great deal on the amber goblets. The plates are cute. I love dining outside. It's been too hot here to enjoy eating outdoors. I live in northern California. pop in to visit me. I love to read what other tablescapers are inspired by. I think you are the first one I've run across to start with napkin rings, and what cute napkin rings they are! The whole table came together beautifully, and your photos are wonderful! I am your newest follower (#333)! Pretty table, Betty. The button plate reminds me of bubble wrap! Very pretty table. Love your napkin rings. I have very similar goblets that my aunt bought for me in the 1960's! They came from a large department store. Some one kept yours nice all these years for you until you found them . Sweet little button napkin rings...I like the way your salad plates echo the round buttons. Nice late summer or autumn color palette. Terrific job! Very pretty, Betty! The button plates are so interesting, and the colors of the other plates are lovely. It is a wonderful setting for an outdoor dinner! Thanks for linking up to Let's Dish! I am in love with the button plates!! They are the coolest looking plates I have seen in a long time. I love all the gold...so pretty! Come link up to Centerpiece Wednesday on my blog and share your lovely tablescape with us.